This year’s field day was a special one for the Southwest Research Center. Along with its normal field day presentations, the Center hosted nearly 2,000 area high school students and broke ground on a new facility. The event took place on Thursday, Sept. 13. This year’s field day was a special one for the Southwest Research Center. Along with its normal field day presentations, the Center hosted nearly 2,000 area high school students and broke ground on a new facility. The event took place on Thursday, Sept. 13. “The entire day was really exciting,” Superintendent David Cope said. 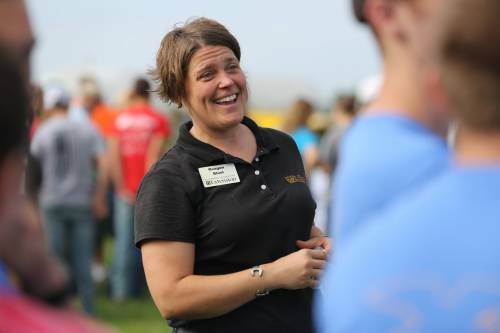 “Our agriculture education day always draws a large crowd, with students having an opportunity to meet with researchers and program directors. Our producers who attended not only had a chance to hear about how to deal with weeds, they were able to chat with all of the agriculture education speakers. Reagan Bluel, MU Extension field specialist in dairy, talks with students at Southwest Research Center field day. The field day was focused on weed management tips and tools. Kevin Bradley, a professor in the Division of Plant Sciences, led that portion of the morning. He brought along two of his graduate students as well to talk with attendees about weed issues. High school students from across the entire corner of southwest Missouri made the trip to the Southwest Research Center during the morning as well. This is the first year that the Center has combined its field day with its agriculture education day. Those students were able to hear from more than 30 speakers, each of who touched on a different aspect of agriculture. The students were also able to hear more about the University of Missouri and the College of Agriculture, Food and Natural Resources. The afternoon was devoted to the official groundbreaking ceremony of a new facility that will soon be built at the Southwest Research Center. Cope led the presentation and was followed by Marc Linit, senior associate dean in the College of Agriculture, Food and Natural Resources (CAFNR). CAFNR Vice Chancellor and Dean Christopher Daubert and University of Missouri Chancellor Alexander Cartwright also shared their excitement about the project. Schreiber Foods was recognized during the ceremony as well, after donating $50,000 to the Center. For a closer look at the Southwest Research Center field day, visit: flickr.com/photos/cafnr/albums/72157701057375054.